Undergraduate and postgraduate students in education, sociology and gender studies, as well as the general reader with an interest in education or gender. Madeleine Arnot is Lecturer in the Sociology of Education at the University of Cambridge, and a Fellow of Jesus College. Miriam David is Visiting Professorial Fellow at the London University Institute of Education. Gaby Weiner is Professor of Teacher Education and Research Ume? University, Sweden. Part I: Refashioning Gender Relations. 1. Revisiting Gender in the 1990s. 2. Changing Gender Patterns in Education. Part II: Social Policy and Education Reform. 4. Motherhood and Women's Work in the Welfare State. 5. Schooling, Teachers and Feminism. 6. Markets, Competition and Performance. Part III: New Generations of Girls and Boys. 7. Schoolgirls and Social Change. 8. Schoolboys and Social Change. 9. Closing the Gender Gap in Education?. Authors' Note on Further Reading. * A comprehensive and up-to-date account of the developments in British education from 1945 to the present day. * Focuses on how and why the gender gap is closing in the British education system. 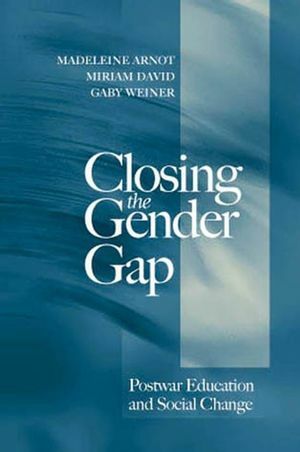 * Offers a new treatment of gender issues in education, that seeks to describe and explain change rather than (as has been the case in the past) campaign for change or report on policy.